Flyers right winger Dale Weise in action during a preseason game against the New York Islanders. The Flyers' flight to Ottawa late Tuesday was more than subdued. Fact is, it was church-quiet. It had nothing to do with the Flyers' being exhausted from their home opener against San Jose earlier that night. It had everything to do with the embarrassment the players and coaches felt from that game, an 8-2 loss before a boo-happy sellout crowd that probably wondered whether this was going to be another wasted season. "It was maybe the quietest since I've been here," winger Dale Weise said of the flight from Philadelphia. "We've got a pretty talkative group and we're good at putting things behind us, but we were ticked off, and even the next morning, guys were still pretty ticked off." To their credit, they channeled that anger and bounced back to win, 7-4, in Ottawa the next night. "It says a lot about our character after what happened," defenseman Shayne Gostisbehere said. And it says a lot about Weise's character that, in his first appearance of the young season, he was able to play such a key role. He drew a penalty, set up a pair of goals — including a Scott Laughton rebound that gave the Flyers the lead for good at 4-3 — and provided physicality against the inexperienced Senators. Weise, now in his ninth NHL season, had been benched in the first three games and it had to feel like 2017-18 all over again. He played in just 46 games and managed only four goals. Both were his lowest totals since 2012-13, when he played in Vancouver. It's difficult for any player to sit in the press box and not be able to help decide a game. It's extra difficult for someone who has been a longtime regular, as Weise was with Montreal and Vancouver. Even though he had become almost accustomed to sitting out lots of games with the Flyers, it didn't make it any easier. "It's extremely hard — mentally, as much as physically — to go through what I've gone through the last week and half here," Weise said about his early-season benchings. "You try your best, condition-wise, and get in the extra skates." When Weise does play after sitting for an extended period, it can take a shift or two to get the rust off. "But the past couple years, I've been in and out of the lineup so much that I'm used to it by now," said Weise, who cleared waivers Oct. 2 but remained with the team. Weise is in the lineup because left winger James van Riemsdyk is expected to miss five or six weeks with a knee injury. Jordan Weal was given the first chance to replace van Riemsdyk but was ineffective (like many players) in the blowout loss to San Jose. Laughton, who is blossoming into the type of player the Flyers expected when they took him in the first round of the 2012 draft, was promoted from the fourth line to the third line, filling van Riemsdyk's old spot. That left an opening on the fourth line, and Weise was given an opportunity. If he continues to play as he did Wednesday, he may not be spending as much time in the press box. Weise is one of the most respected players in the Flyers' locker room. "He's a great team guy. He loves the boys and he's always ready to hop back in," center Sean Couturier said. "He brings energy." Weise, 30, is an old-school player. He doesn't have the speed of many of today's players, but he compensates with a grind-it-out, physical effort. Count Dave Hakstol as one of his admirers. "The key to coming into the lineup isn't just coming in; it's adding something and helping your team win," the fourth-year coach said. "Weiser did that" Wednesday. 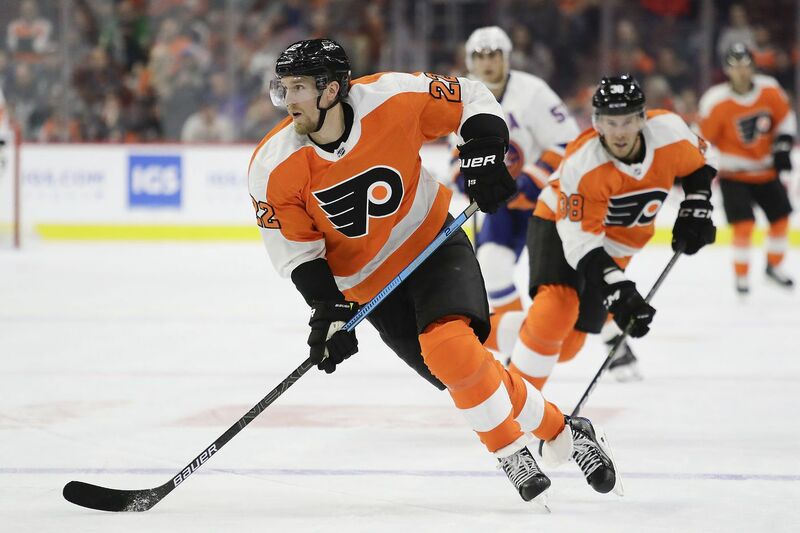 When general manager Ron Hextall signed Weise to a four-year, $9.4 million deal (annual cap hit: $2.35 million) in the summer of 2016, the winger was coming off a 14-goal season. Hextall called him a top-nine player who would "add to our depth scoring." Three seasons later, the Flyers would gladly settle for Weise's being a productive fourth-liner who plays with an edge, provides veteran leadership, and provides his team with a steady two-way game as he did in Ottawa.